Not widely recognised today, the Kooikerhondje tells a colourful tale of life in its early development. Its name should probably hold the title for most unusual, but it does have a very literal translation. Hailing from the Netherlands where it was traditionally used to toll and retrieve water fowl, the hunter (Kooiker) relied heavily on his dog (honje) for a livelihood. Exactly how and where the Kooikerhondje developed is difficult to pinpoint although everyone seems to have their theories. Artwork from the 16th and 17th centuries depicts a working spaniel-type dog that could be the Kooikerhondje, which dates the breed to this particular time period. The original role of the dog was to lure ducks away from safety and into the traps set by the awaiting Kooiker. He would then be perfectly placed to catch the animal, although his dog would sometimes be asked to retrieve it. Today, the practice is seldom seen and is considered slightly medieval; however the enduring popularity of the Kooikerhondje is still evident in native Holland. Unfortunately the breed suffered huge decline during the Second World War along with so many other breeds, purely because there were other priorities and fewer waterfowl to hunt. So enamoured by the breed, Baroness van Hardenbroek decided to intervene in 1939 to protect the Kooikerhondje from imminent extinction. A known eccentric, the Baroness was rumoured to be assisting the Allies reach the Belgian border, by using her dogs to guide them through the treacherous forests. The Kooikerhondje was her breed of choice and she went to great lengths to try and preserve it. She is even believed to have distributed pictures and small locks of Kooikerhondje hair to pedlars in the hope they would find her another dog to breed from. 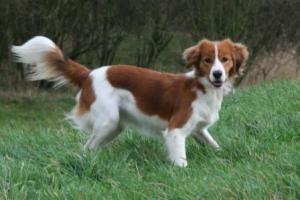 Eventually, one such dog was found – a female Kooikerhondje that the Baroness named ‘Tommie.’ This dog came from Friesland and is accepted as the ancestor of all modern Kooikerhonjes today. Tommie’s first litter came in 1942 but it wasn’t until many years of careful breeding later, the 20th December 1971, to be precise, that the breed was accepted onto the register by the Dutch Kennel Club. While the breed is uncommon today, it does not go unseen. Owners describe the Kooikerhondje as inherently gentle and playful, able to adapt well to new situations and people, and capable of being trained to a good degree. On average, a healthy Kooikerhondje will weigh 9-18 kg at maturity, with a life expectancy of 12-14 years when given the correct care. - Some enthusiasts believe the breed could have played a part in the development of the Nova Scotia Tolling Retriever. - The breed is inclined to be fearful of strangers so early socialisation is important.